Star Wars: Doctor Aphra #16 is the kind of comic book that Star Wars fans should love because it is a self-reliant story within the Star Wars universe. While it still must maintain itself within the confines of continuity it is less reliant on serving the movies and just telling a good story. Writer Kieron Gillen has taken full advantage of the freedom that comes from not serving the big screen. 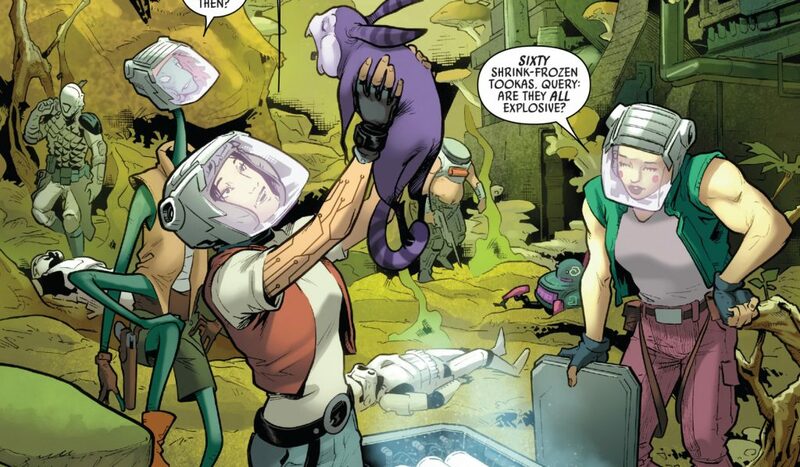 Doctor Aphra allows itself to have some fun along with the adventure. 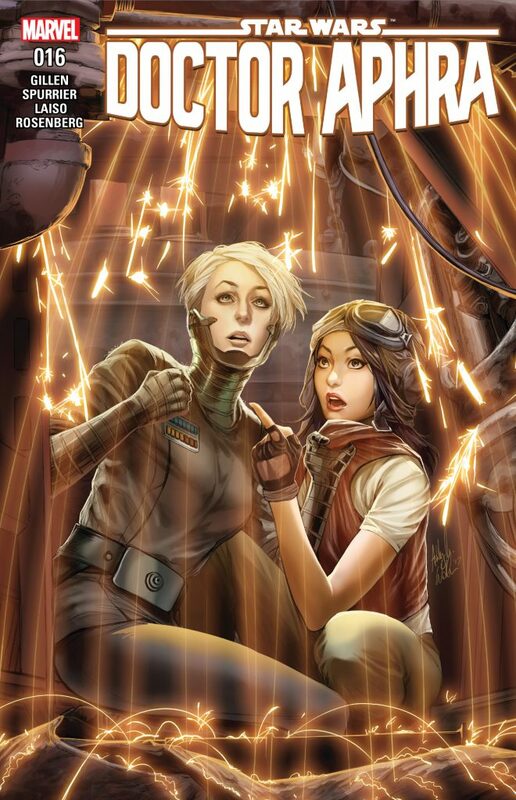 In part 3 of “Remastered” Gillen crafts a story that concludes with Aphra doing her due diligence for Triple-Zero while still exploring a very tense relationship with her pursuer Imperial Inspector, Magna Tolvan. Gillen has never shied away from Tolvan and Aphra’s attraction to one another all while keeping up a fast-paced action adventure story with cute but explosive Tookas and a wild array of borderline criminal characters. When Aphra must yell “snugglebum oogiewoogie” to detonate a living weapon you know that Gillen has a lot of freedom when telling this story. The story is action-packed with Triple-Zero in control of Aphra and the eventual consequences of stealing the data that Triple-Zero is so desperately missing. Gillen also has a fondness for building relationships that color even the most dire of consequences especially when it comes to Aphra and Magna Toven. Their tension and eventual romantic embrace are a standout moment in the chaos that envelops all the characters. Artist Simon Spurrier also keeps the pace frenetic but maintains clarity in the details and magnifies the moments of the most importance with great line work and well defined facial expressions. Spurrier really knows how to illustrate sci-fi action as well as dramatic and fun emotions. 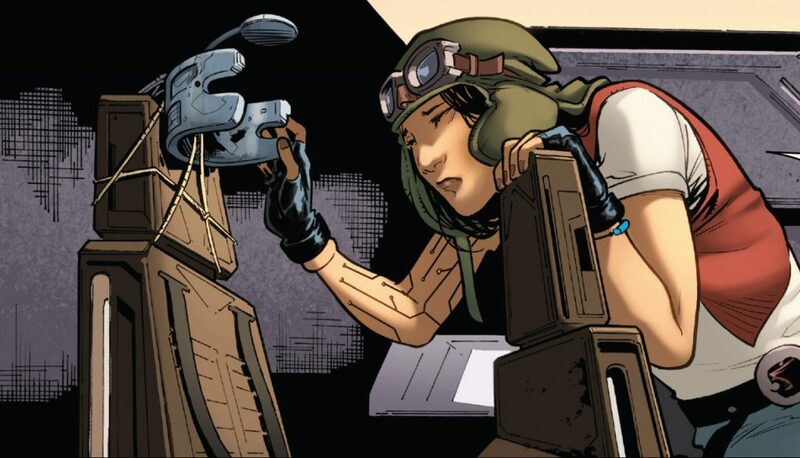 I only wish that there were more books like Doctor Aphra in the Star Wars line of comics that focus more on characters we don’t see in the movies or that tell a more layered story from characters that are underutilized on the big screen. Gillen seems to be having fun writing Aphra and we can only hope that more books like this start to appear in the Star Wars universe.